← ROGER THAT! NOLLYWOOD NEEDS FILM CRITICS. A Nigerian Professor of English once famously remarked that Nigerians hardly read and even when they do it is mostly religious tracts. She commented that on a casual trip using the Underground in the UK most British passengers are seen reading a book or magazine in the trains. This is not so with Nigerians. Since the inception of his administration, President Goodluck Jonathan has been struggling to revive the reading culture through his “Bring Back the Book” project, and has even gone as far as enrolling the help of the Nobel Laureate, Wole Soyinka. But somehow Nigerians have refused to embrace en-masse a healthy reading culture. That is until recently. Or so? In the South East, the Igbo heartland, an interesting and intriguing phenomenon has arisen. Since the death of the literary icon, Chinua Achebe, it has now become fashionable to go about with a copy of his pseudo-memoir, There was a Country. The young boys who sell the books (are they pirated copies?) are doing brisk business and for once in my life I see a book – other than the Bible – outsell phone chargers and recharge cards in traffic. The President and Wole Soyinka must hear this. Now wait for this – last week I rode a Keke (motorised Tricycle) and the driver had his copy. 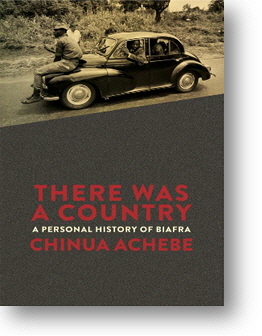 Now, There was a Country stirred up so many passions when it was published especially as some sections of the country quarreled with Achebe’s version of what happened during the War, and comically it became one of the few books in the world where reviews and critiques were dished out without the reviewers reading the book. Since the death of the grandfather of African literature, his last work has not only become a status symbol and fashionable, it has ‘forced’ the average Igbo person – nay Nigerian – to read a book. Well I can’t vouch that all buyers of the book are reading it (a fairly sizable tome), but I can vouch that I am very surprised at the enthusiasm to acquire a copy. As we get ready for the funeral of Chinua Achebe, his literary daughter, Chimamanda Adichie, an effusive and talented writer, is literally toeing the line as her soon to be released novel, Americanah, is already courting controversy, over African women’s hair. A few months ago Chinua Achebe was denounced as an angry, nepotic old man who tilted his version of the Civil War, today in the wake of his death, he not only has become revered he has spawned a ‘reading culture’ in Igboland and across the nation. Maybe we need more of these controversial books. This entry was tagged Americanah, Bring back the book, Chimamanda Adichie, Chinua Achebe, Igbo, Keke, There was a country, Wole Soyinka. Bookmark the permalink.